You can invite friends into your events, groups or profile by using the “Invite” button on the main backend dashboard. If you hover over the “Invite” button it will expand to show different options. You can invite existing followers or friends via email or social media to your profile (These are your followers), to an event you’re hosting or to join a group page you have created. Group pages are great as you can use them as little communities with their own forum. Invite friends into your groups to build up members within the group. Group members are then notified regularly of events or posts you create there. Follow profile: This will invite your friends to follow your profile. They can then use their dashboard and favourites to easily locate your pages and groups. You can also then invite your profile followers into your groups. Users who follow your profile also receive emails and notifications if you post an article or post. Invite friends to your groups: Build up members in your group page so they can participate in your forum and create topics or reply to comments. Group members also receive weekly newsletters with your events and any posts you create within your group. Free groups only allow five free members. Upgrade for unlimited members to join your group. 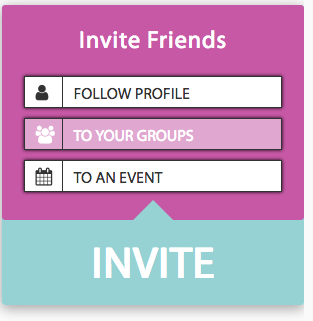 Invite friends to an event: Here you can invite your friends to an event page you have created. Users can then click a button to say if they’re attending, maybe attending or not attending. We take your privacy very seriously. Any email addresses you upload or use to invite friends are not shared with any third parties and are only used strictly for inviting your friends to the website. What is a Group page?